Even mid-morning on a Friday, Pacific Coast Highway through LA can be daunting. But this time was different. Wonderfully different. I wasn’t in a hurry to get anywhere. Normally, road rage will be the death of my soul someday. I am used to LA traffic sadly. We drive angry. Just because we don’t honk (that’s against the law in CA, unless you are trying to avoid an accident, lots of room for interpretation there) like NYC, don’t underestimate the propensity for angry responses in varying degrees of expression. I traversed Malibu with my normal indifference. A not so subtle reminder of the very wealthy who have bought up Southern California’s beautiful beaches, making them nearly inaccessible to the other 99% of us poor slobs. I suppose it is only fitting, if I lived there I’d just sit and stare at the sun on the water mesmerized by the vista, and worry about how I was going to pay my property taxes. Wait, I already do that sans the vista. Nevermind. Where were my ancestors when they moved to Southern California and beach property was still affordable? Not at the beach. I’m still a little mad at them about that. Somehow in Oxnard, I got off of highway 1 and ended up at Port Hueneme. What the heck? I assumed that highway 1 would hug the coast, and like an idiot right out of the gate, I got lost. Damn my old school pony (Mustang). Well, not really. I still love it despite its retro gadget-less-ness. I stop for gas and put down the convertible top. Bad move. A homeless man decides he is going to jump in my car and “go with me” as he put it. Before I could even wipe off the look of horror/terror off of my face, the gas station owner came running out and berated him to be on his way. Whew, that was a close one. Note to myself…DO NOT PUT DOWN CONVERTIBLE TOP WHEN ON A SIDE STREET OF OXNARD AND AN OBVIOUS TRAVELING SOLO FEMALE DRIVER. Check. I acquiesced to using the GPS on my phone to get back on track. I don’t care for Oxnard. Just sayin’. North inland to Ventura where the 1/101 again run alongside the beautiful Pacific Coast. I love Ventura, I have spent a few fabulous weekends there. The convertible top came down again so I didn’t miss this tiny bit of shoreline running alongside the highway. While it is beautiful, I am aware of the fact that I am still on a 4 lane freeway. On in to Santa Barbara where the 1/101 again veer inland. I love Santa Barbara. It’s like a clean, shiny, Spanish diamond with its white washed walls and tiled roof tops. Even the freeway is beautifully lined with mature Eucalyptus and oak trees. Just passing through this time, but I have spent time in Santa Barbara and only scratched the surface of what secrets this city holds in unparalleled beauty, history, sea life, and being the gateway to the Channel Islands. I spent a weekend camping and sea cave kayaking on Santa Cruz Island which is one of my most spectacular bucket list accomplishments (especially since my kayak was taking on water which qualifies it for the “value added” bucket list). I reluctantly leave Santa Barbara and about 10 miles (I’m not good with miles so don’t quote me) out of town we (my pony and me) meet up again with the sea. Highway 1/101 only teases me with a short view of its blue sparkling prize (the mighty Pacific) before we turn sharply back inland. After Gaviota State Park, highway 1 and 101 part ways, with the Pacific Coast Highway 1 continuing to Lompoc. Despite the fact that it is inland, this is a gorgeous drive through native California flora and fauna. Once PCH splits off from the 101, you are truly now away from the populace that characterizes Southern California. Only those wishing to experience the Pacific Coast Highway are on this 2 lane road. There are no more big wheel trucks, no more manic commuters. I notice that I can breathe in every sense of the word. I have been through here before, but not like this. Not with the convertible top down where I have a 360 degree view, where my eyes can follow the hawk that is following me. The view is not the only sensory pleasure afforded by my convertible. The aroma of native California scrubs like Sage, Sage Brush, Lilac, Poppy, Chaparral (all preceded by California in their proper names) create a heady brew that as it excites the olfactory, invites the mind and soul to deeply breathe it in and relax. This is the unique perfume of my home, and I would not trade it for the world. On to Lompoc where highway 1 turns sharply left and to the right becomes highway 246 North. I had planned on taking a couple of detours for personal site seeing opportunities in Lompoc. La Purisima Mission to the north, and Surf Beach to the south, but I’ll admit it, Oxnard and my near hijack incident had shaken my already fragile courage and I decided to pick just one. I chose Surf Beach. This trip was about the ocean, and while I love California’s old missions, I wanted to see the surfers at Surf Beach. I turned left and instead of following highway 1 as it sharply turned right (still inland), I continued straight south on what had become 246 south. This road is so lonely and untraveled I began to have misgivings about my choice. Surrounded by farmland on both sides I grew more and more worried that I had taken the wrong road. The 9.5 miles south seemed like 100 miles when double guessing my route the entire way. The brilliant blue sky started becoming greyer and greyer as I neared the ocean. As I paralleled the lazy Santa Ynez river, it’s green marshy inlets and brown backflows seemed increasingly cold, marshy, and forbidding as the skies became heavier with what is known as the “May Grey” conditions of California springtime coastal weather. By the time I reached Surf Beach I had nearly turned back a few times. This uncertainty is unique to traveling alone, normally there is another warm body to confer with, and in my case – my fearless hubby would be up for whatever adventure this road would bring, even if it was the wrong one. I parked the car in the train station/beach parking lot at the end of the road. Evidently this is a train stop for the Pacific Surfliner. I couldn’t possibly think of who would commute to and from here, unless it was a surfer. I don’t know what I thought I expected to see. I suppose serious disciples of the sport (they would have to be since this is in the middle of friggin’ nowhere, at least by crowded So Cali standards where surfers fight to “drop in” a wave). Not a soul in sight. 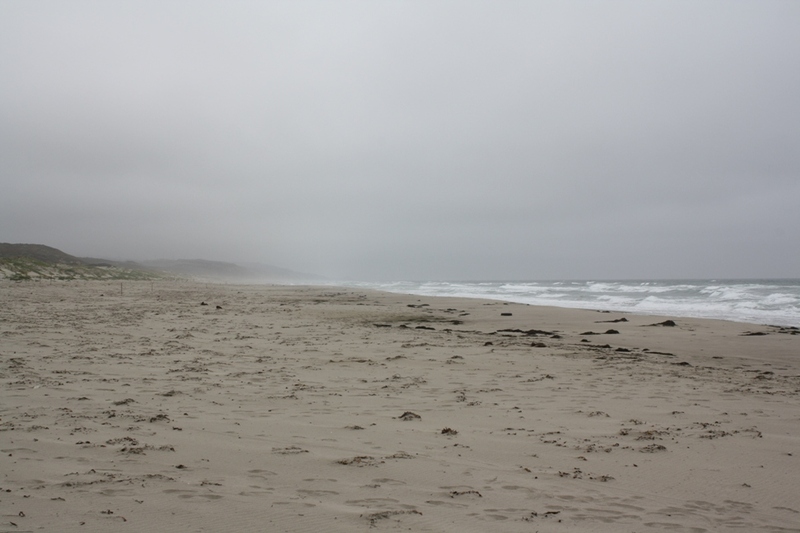 As I headed down to the dismally grey beach, I think I discovered why it was so deserted. This sign was posted prominently at the gateway over the railroad tracks. Fatal shark attacks really? Plural? Then I saw it. A memorial to a fallen brother. 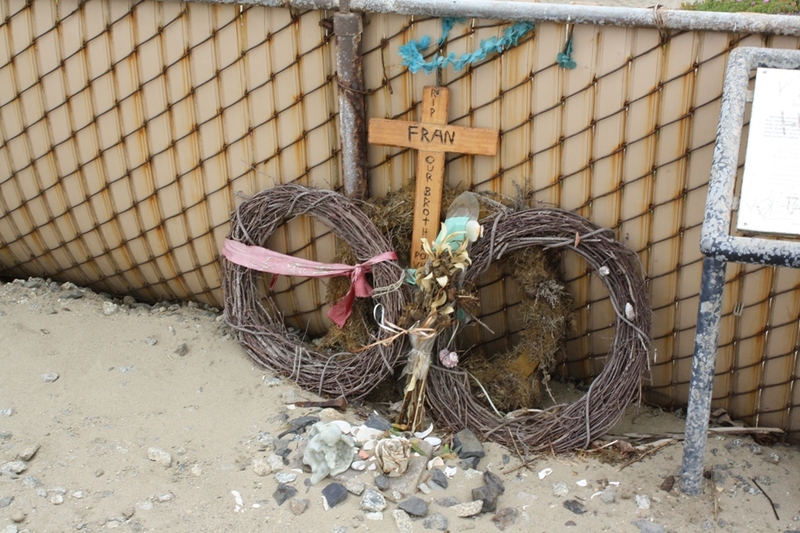 I googled the name after I got home and found the tribute to belong to Francisco Javier Solorio Jr., a 39 year old who was killed by a Great White Shark while surfing in October of 2012. 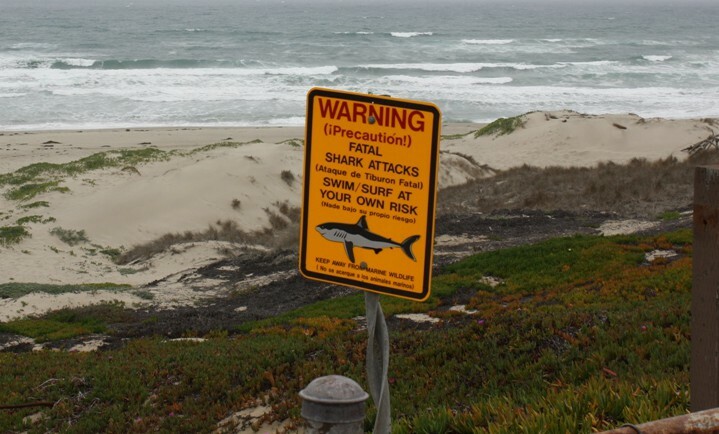 His death was preceded almost exactly to the day in 2010 by Lucas Ransom 19, whose life was ended by another Great White Shark while surfing at this beach. No wonder the beach was so grey. Was it still in mourning over the death of two of its native sons? It was windy and cold as I walked down the beach. The dunes and grass were beautiful, but I didn’t feel peaceful like I usually do when in the presence of crashing waves. The waters seemed treacherous, with rip tides clearly visible in the surf. I felt very alone, cold, and forlorn. Whatever this beach is to its devoted surfers, it was lost to me on this day. I left for Lompoc to resume my inland trek on PCH another 53 miles to Pismo Beach, which is one of my favorite beaches in California. 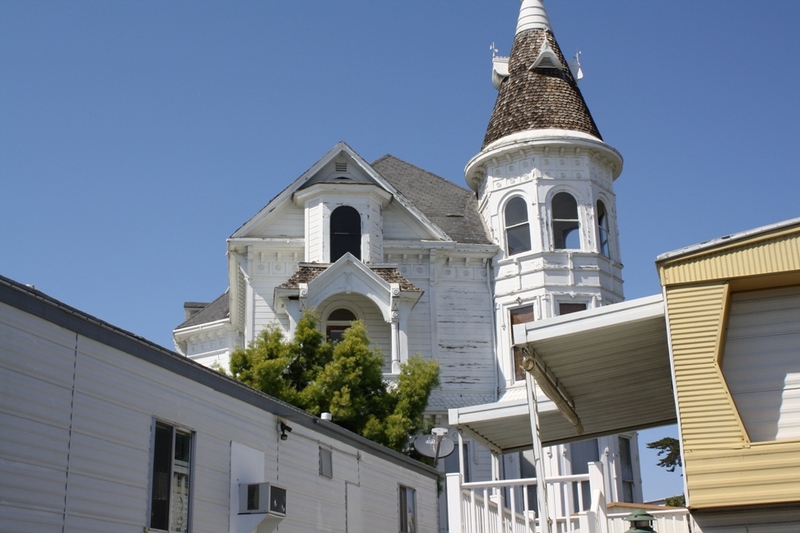 After passing the Vandenberg Air Force Base, there are several quaint little towns along the highway, but an old Victorian Home in Oceano piqued my curiosity. A gorgeous white monolith of a home literally locked in by mobile homes. What? I had to get closer, even if it meant driving through the private mobile home park. I couldn’t resist sneaking up a driveway to get a shot of the side. Beautiful…but sad from neglect and creepy looking. Once again, God bless google. 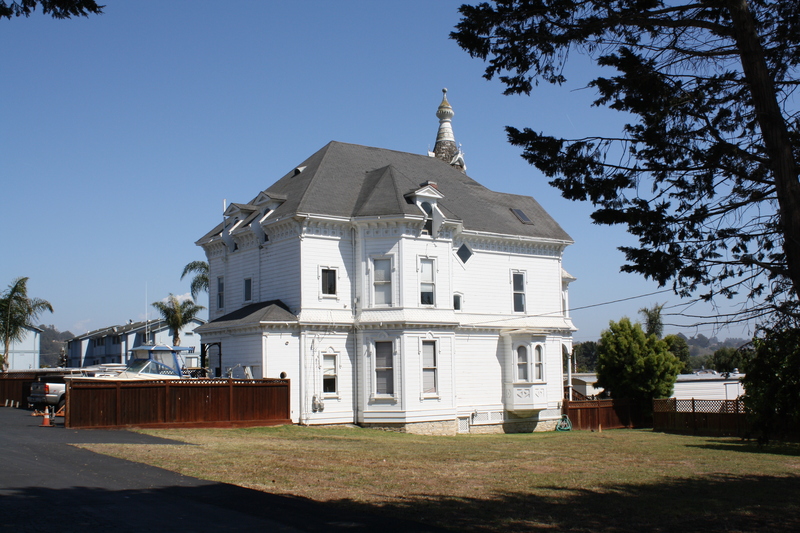 Once I settled into my hotel in Pismo Beach for the night, I discovered this is the Coffee T. Rice house, built in 1885 by a wealthy businessman from Ohio in anticipation of the railroad coming through the area. Beset by the death of his son and soon after his wife, and in financial ruin from delays by the railroad, Mr. Rice moved out just 10 years later a broken man. The place was then bought and used as a Sanatorium where many deaths are said to have occurred. Since that time the house has changed hands pretty frequently. There is said to be a large blood stain that despite heavy cleaning over the years, reappears in the same spot. It certainly looks like it would fit the bill for a haunted house. On to Pismo Beach and the ocean again. Finally. I arrived earlier than planned, and well before check-in time. Fine with me, I love this place. 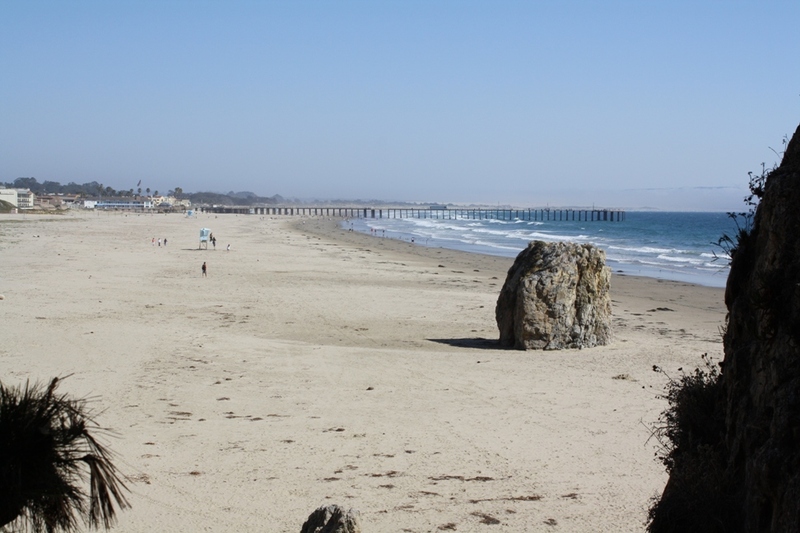 To me, Pismo Beach embodies all of the qualifications that I envision to qualify as a quintessential California beach. Miles and miles of fine sand, a well kept pier, a town center with surf shops and eclectic eateries, a cloudless sunny sky. I abandoned my pony n the hotel parking lot and headed for a trek along the beach to the pier. It was a bit of distance, but the sea did it’s work. The sun shining brilliantly on the water, the slight surf just kissing my feet, and sound of waves barely breaking against the shore mixed with laughter from children playing in the distance, brought what I had hoped to find on this trip. Peace. Hope. A kinship with the rhythms of nature. But I did feel a slight bit of melancholy from being away from my family. We have such good memories from this place, and being alone was in sharp contrast to what I had ever known previously here. I could see my daughter as a little girl running ahead of me with her sand pail. I was lost in these thoughts when a voice spoke to me. It was God, interrupting the usual manic pace of my thoughts. I had to chuckle a little at that. To this day, I may be the only person on Earth that has to fight falling asleep during an MRI because I feel so comfortable and safe in such close quarters. Wouldn’t the doctors be horrified if they knew why? Still makes me laugh. My own secret. Well, mine and Jesus’s. Evidently the single pair of footprints on the Pismo Beach sand were from him carrying me. I continued my trek into town marveling at how clear I had heard his voice. He was right, revisiting that past did not hold its usual dread. I was left with the warm, safe, peaceful feeling I had fallen asleep to between the mattress and the wall 46 years ago. I bought my dinner at a little Mexican restaurant just off the pier that I cannot recommend. I walked back in time to check-in to my glorious room. If this was any indication, the rest of my trip would be magical. My view was extraordinary. The gleaming sea, palm trees, and the rocky cliffs north of the beach. Such a contrast to Surf Beach. I spotted whales feeding off the shore. It was surreal. I met a lovely woman from Canada in the patio next to mine. We spoke for a while as we watched the whales and the sun disappear on the horizon. 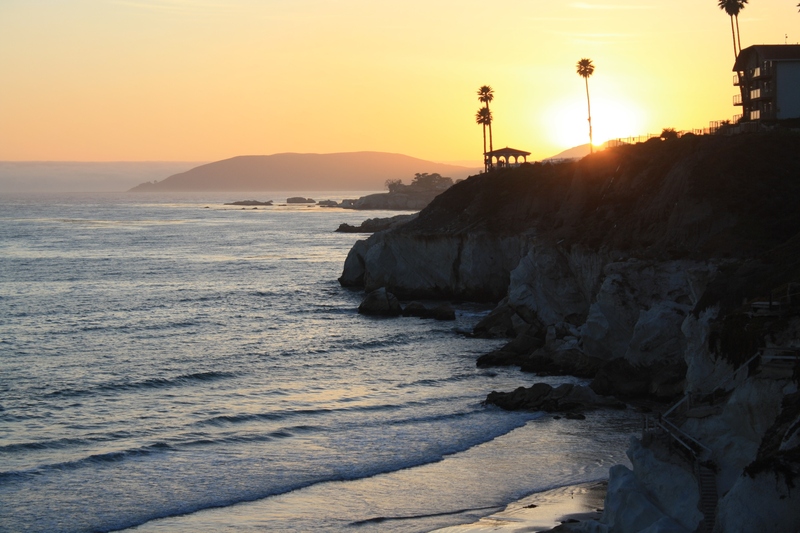 I leave you today dear diary with the glorious Pismo Beach sunset. Day two is Pismo Beach to Monterey. I hope you stay with me. This entry was posted in Road Trips, Travel and tagged Baby Boomer, Bucket List, Bucket List Adventures, Bucket List Travel, Coffee T. Rice House, Dear Diary, Highway 1, Pacific Coast, Pacific Coast Highway, Pacific Coast Highway Road Trip, Pacific Coast Highway Solo, Pismo Beach CA, Retirement, Solo Road Trip, Surf Beach CA by ckdenson. Bookmark the permalink. 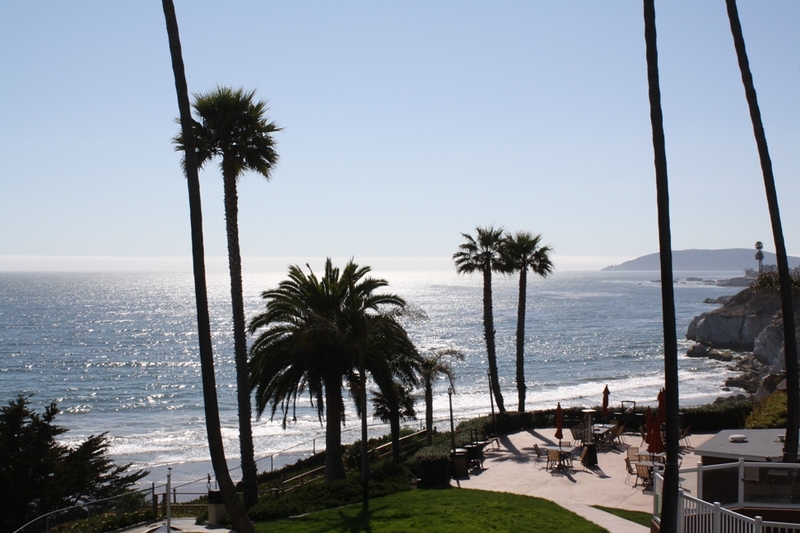 I found this blog today while planning a trip to Pismo (looks like you stayed at the Seacrest- my favorite!) and them on to Monterey. Love your writing! !